The iPixi X100FHD (also called the Winycam X100FHD) is a unique camera with many features which make it stand out from the others. At £199.99 it's priced at the top end of the range and has full HD, GPS mapping for speed and location tracking, a g-sensor to monitor impacts, parking protection, and a unique swivel lens allowing you to point the camera inside the car - a feature particularly useful for taxi drivers and driving instructors. Full HD quality video (1920 x 1080) at 30fps. 130° wide angle lens with a 2MP CMOS sensor. Rotating camera for front/rear recording. MicroSD cards up to 32GB. 16GB card supplied. The first thing we noticed when opening the box and unpacking the camera was that is felt like a sturdy and well built unit. The materials oozed quality and it was firmly put together. You get all the essentials in the box but no spare adhesive pads means there's no backup in case you want to move the camera later. You can always get spare adhesive pads from eBay though if you need to. The camera contains a single record button which is used to change the camera modes and manually lock a video file. There are 2 LED lights at the rear of the camera which are visible to the driver, one for power and another to signal it's recording. The SD card slot is underneath the camera and there's a front facing LED which flashed as you drive along. This light is very bright and overbearing at night but you can turn it off in the camera settings. The installation process is simple. In our test we stuck the camera behind the rear view mirror so it's tucked out of the way from the drivers' view. Of course, this means that when you rotate the lens it will record the back of the mirror so if you need this feature you'll need to mount the camera further down the window or to one side. However, always be mindful that you mount your camera in a safe and legal position. Once installed, the iPixi X100FHD camera can be adjusted both up/down and left/right to make sure you get the best footage possible. The camera cannot be taken out of the car once it's installed which means you can't tuck it away when you're on holiday or even taken it into the house to view the videos or change the settings. This means you need to take the memory card out of the camera and plug this into your computer instead which can be a little tricky, especially when it's dark. The camera has a nice voice guide system which tells you when it starts and ends recording, amongst other things. It's nice to get the re-assurance that the camera is on and recording rather than having to check the LED lights to make sure it's definitely working. Like many cameras, the software and user manual is supplied on the camera itself, and accessed via the SD card. The software that controls the camera settings and allows you to view the video footage GPS and g-sensor data is only compatible with Windows. Therefore, we don't recommend this camera if you're not a Windows user since you won't be able to change any settings (including the date and time) or view this additional video content. The iPixi (or Winycam) X100FHD camera is very easy to use and setup. It automatically enters into parking mode once the camera hasn't sensed movement for a few minutes and it automatically locks video clips when it senses an impact or sudden shock (via the built in g-sensor). If you want to manually lock a file as you're driving along, simply press the one and only button on the camera. It really is very simple to use - once it's in it just runs itself. The most important factor when it comes to car cameras is the quality of the video - this is what ultimately counts when you need to rely on the evidence. The iPixi X100FHD records in full 1080p HD at 30fps. 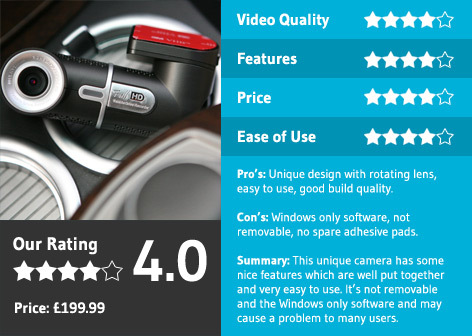 The video quality is on a par with other dash cams in this price range. The rotating lens which allows you to flip the camera to face inside the car is a great feature for taxi drivers and driving instructors that would find recording inside the car useful. You will of course need to make sure to mount the camera in a position that will see in both directions. Normally, you would mount the camera behind the rear-view mirror to keep the camera out of the way, however, this will mean you won't be able to make use of the rotating lens. Changing the settings on the camera needs to be done with the supplied Windows software. You take the card out of the camera and insert it into your computer to load the software. Then, insert the card into the camera again (the camera will be in the car at this point) and the camera will update itself when you turn it on. This can pose a problem when updating the date and time of the camera. Firstly, you set the time using the software on your computer for a time in the future that you will insert the memory card into the camera. You then need to insert the memory card into the camera in your car at this set time. At around the £200 price range, this iPixi/Winycam dash cam has a unique rotating lens and is very easy to use, it's Windows only software and limited portability may limit its appeal to some. The iPixi X100FHD is available to buy online for only £199.99 which comes complete with all the accessories you need to mount it in your car and get up and running.